Prints are available, size 11. Click HERE. This little oil was sold in a Bargoed and District Art Society exhibition back in 1985. A local family bought the painting and they were good enough to answer my request for details of my early paintings : those numbered 1 to - my Thanks to them . Number 107 will now form part of a collection of paintings covering the former "Rhymney Valley". 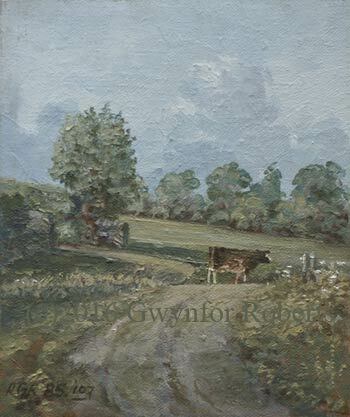 The painting captures Cwmdu Lane with the lone cow grazing on the former Newport to Brecon railway line. A favourite spot of mine which has long gone due to development.